We invite you to enjoy all the wonderful benefits your support of the Figge Art Museum provides. In addition to great membership benefits, there’s nothing like the satisfaction you’ll feel knowing your contribution supports an extraordinary range of educational programs and exhibitions. Click below for a listing of available online funds or continue reading for more information about donations to the museum. The Figge's Annual Fund Drive supports the museum's mission to bring art and people together through our exhibitions and programming. The museum provides around 20 world class exhibitions each year with customized programming to accompany each. Support the Annual Fund by becoming a member at the Benefactor level or above! All donor levels include both an annual membership and a donation to the Annual Fund. 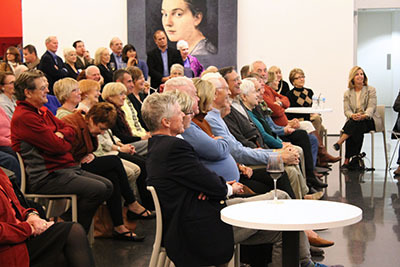 Recognition and membership in the Friends of the Figge begins at the Benefactor level where you receive invitations to even more exciting and special events. We are deeply grateful for the generous gifts from our C.A. Ficke Giving Society members, and we would be honored by your membership in this group. Your planned gift, along with those of other C.A. Ficke Society members, will sustain the Figge Art Museum and help it grow for generations to come. If you have included the Figge in your estate plans and wish to be recognized as a member of the C.A. Ficke Society, please contact Sara Morby, development officer, at 563.345.6642 to submit the required information. The Davenport Municipal Art Gallery, later renamed the Figge Art Museum, became a reality in October, 1925, when Charles August Ficke donated his extensive art collections to the City of Davenport. Charles Ficke was born in Germany in 1850. His family settled in Scott County, Iowa, and at the age of 13, he moved alone to Davenport to enroll in the public schools. He worked as a store clerk and bank cashier before leaving to attend law school in Albany, NY. While attending law school, he visited the Centennial Exposition in Philadelphia. He later credited this visit with sharpening his vague interest in art into something approaching devotion. After serving two terms as mayor of Davenport, Charles spent the next several years traveling the world. On those trips, Charles acquired many artistic and cultural items, establishing the foundation of what would become an extensive art collection. In 1924, Ficke told the Davenport City Council he would donate his art collections to the city. Charles sent a formal letter to the city council stating that he would deliver 270 paintings to the city as soon as the building was ready, and that the balance of the collection would be left to the city when he and his wife passed away. At that time, Robert E. Harsche, then Director of the Chicago Art institute, stated, “No public gallery in America, that he knew of…had started out with such a large number of important paintings as a nucleus.” Charles Ficke died on December 10, 1931, at the age of 81, leaving behind a legacy of generosity and civic support that is not easily equaled in the history of Davenport. The generosity of our donors enables the Figge Art Museum to touch the lives of over 100,000 Quad-City residents each year through exhibits, educational programs, and outreach activities. Your support provides the resources we need to impact the lives of thousands of children and adults. We are pleased that you have an interest in learning about the many benefits of making a planned gift. If you have any questions about the best way for you to benefit through a planned gift, please call Sara Morby, development officer, at 563.345.6642.